Smashing Solo by Bobby Moderow, EKK on Kauai 2013. Follow the link below for event pictures. Bobby….it’s been a long time coming, but now that you finally made it to EKK, don’t be a stranger. I must have met Bobby over ten years ago and asked him repeatedly to come to EKK, but timing was not in our favor. I am as persistent as the day is long, so this year I caught him at the right time and he graciously finally agreed to present at one of our Monday nights. Now that the EKK bug has bitten him, he asked publicly in front of the entire audience if he could come back again because the format of our program is exactly what he loves. I have been spoiling EKK audiences with full-on shows that border on “extravaganzas” although we call it an “intimate evening of backyard jam”, so I was a bit apprehensive about bringing in Bobby as a solo gig . . . but not to worry for he not only filled the entire stage with his toe-tapping, foot-stomping body gyrations that are signature to his style of playing slack key, he charmed the audience with his Portugee gift of gab, and definitely had everyone screaming for more with his beautiful falsetto voice. Bobby kept up a running commentary between the many songs he shared. “It’s not easy with so much going on at once — trying to tune, trying to keep talking, watching the time, thinking what song next — and although it does not show, I was really nervous up there.” As many performers know, a little bit of nervousness really adds to a wonderful performance and that is exactly what Bobby Moderow delivered. Musicians love to share their musical lineage and honor those who came before them. Bobby was fortunate to pursue his passion at an early age when the legendary Raymond Kane broke tradition of keeping slack key secrets and would share his knowledge with anyone who wanted to trade lessons for fresh fish catch or a five pound can of ham. When Bobby was first showing up at Uncle Raymond Kane’s home to learn slack key, the master asked, “What is this haole boy doing here?” to which Bobby’s Hawaiian friend answered, “No, no…he’s my nephew; he was just born at night,” referring to Bobby’s pigment-challenged skin tone. To honor his mentor, Bobby launched into Uncle Ray’s well-known slack key number with his own added licks. As he tunes his guitar, he shares stories about the songs. He has a way of telling it like he was there and you are there with him. The name of his group is Maunaluaand so was the song he shared about a gentleman who went from island to island aboard the interisland steamer shipMaunalua who was very giving of his aloha to other women. Shifting from the rough voice to the falsetto, he demonstrated an old style of singing. Oma and Opa, from Germany, met in New York in the 1930’s and took a honeymoon trip aboard the PanAm Clipper Ship. They stopped in Honolulu for refueling and Grandpa said, “This place ain’t too shabby,” and they never made it back to New York.His German Dad met and married his Portuguese Mom from Hilo. Bobby grew up on O’ahu with a lot of country music. At the tender age of seven or eight, his teacher sent him home with an application to the newly formed Honolulu Boys Choir with a post-it note that read, “Please look into this application; Bobby’s been singing in class and needs an outlet.” Fortunately, his third generation Portuguese Mother followed up and Bobby sang in the Choir for four years. What prompted him to continue with falsetto was this voice in his head of Dennis Pavao’s singing, so he kept on singing until his Mother told him to “stop singing falsetto because it sounds like a cat.” But he kept up with the leo kie kie, listening endlessly to theLove Song of Kalua from the movie Bird of Paradise. He sang all the parts from the pulsating low sounds to the high pitched melodic strains and the running commentary describing Debra Paget walking to the edge of the volcano. Another big influence on his music was the genious guitar player Peter Moon whose “fingers floated over the fret board.” Bobby launched into his own version of Hi’ilawe. He then went into the fast-paced Ka’a Ahi Kahului by Palani Vaughan about the first sugar train in Hawai’i. 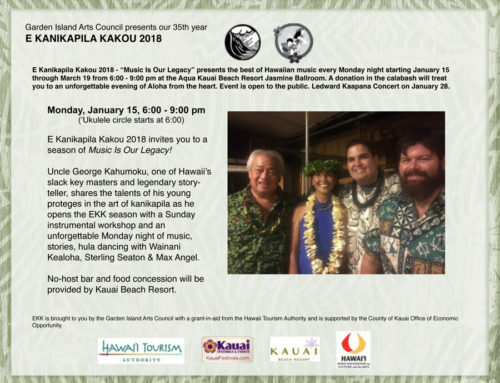 After this fast-paced number, he soared in the rafters withKale’ohana composed by Moon Kaukahi of the Makaha Sons when Pi’i Kaleohana gifted a guitar to Skippy Kamakawiwo’ole. Another well-loved song by his uncle Jerry Santos was Ku’u Home O Kahalu’u which Bobby pointed out made a major impact on the world of Hawaiian music at that time. As a young kid he sat in the first row of every concert in which Ledward performed. Not a bit shy, Bobby would go up and ask Ledward how he played something new; he then launched into the instrumental Poi Song. The ‘ukulele group had a chance to perform the two songs they learned during the first hour. Pauoa Liko Ka Lehua and Wai O Ke Aniani.They were good! After his smashing solo performance, numerous audience members came up and told me, “You need to bring him back again!” “Next time it will be with his groupMaunalua,” was my answer. I even got a call from Dennis Marley from Portland, Oregon who had the good fortune of sitting next to Bobby on the plane, Dennis took the time to phone me to share how awesome he felt Bobby’s show was. “We were absolutely stunned by his ability,” was his praise. Bobby was blown away when I told him after the show, “Wow…a standing O; our audience is a really appreciative audience, but that does not happen all the time…just want you to know.” With his signature song,Sanoe, where his pure clear unamplified falsetto gave everyone chicken skin, Bobby was in his element. The story of Queen Lili’u’okalani and her wisdom to let young love flower as it should was the poignant lead into the song, the beautiful slack key opening of the song followed by his pure high voice, and ending with his dramatic instrumental licks . . . that was magical. The audience stood up as one body and screamed hana hou in unison. Who’s Coming Up Next at EKK? Keikilani and Leo Lindsey celebrate their love of ohana and music by continuing to ‘holo mua’ move forward in their unique interpretations of classic family compositions and traditional Hawaiian favorites. In their deep affection for ‘‘?lelo Hawai’i’, Mele’uhane lends a new voice in ‘haku mele’ and initiates the next generation of Hawaiian stortytellers, endeavoring to explore the many untold tales of the heart. If you have a disability and need assistance call Carol Yotsuda at (808) 245-2733 for Monday events. E Kanikapila Kakou 2013 Hawaiian Music Program is funded in part by the Hawai’i Tourism Authority, the County of Kaua’i Office of Economic Development, and the Garden Island Arts Council supporters with support from Kaua’i Beach Resort. Garden Island Arts Council programs are supported in part by the State Foundation on Culture and the Arts through appropriations from the Hawai’i State Legislature and the National Endowment for the Arts.